Wood is cut off our woodlot during the spring and early summer and left to dry. Once the wood is dry the wood shed is filled with 18 cord of wood in preparation for the upcoming maple season. In February we tap as soon as we see a mild spell coming in the long range weather forecast. 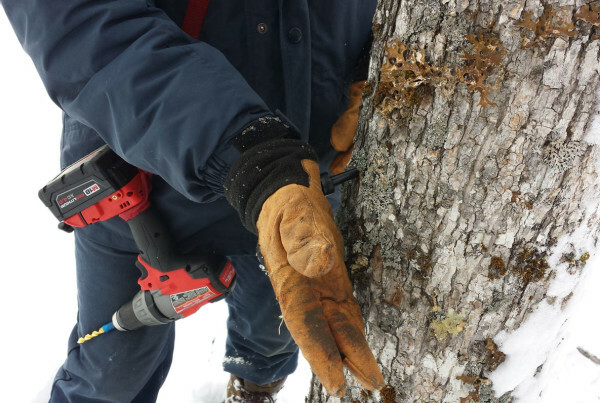 We drill a 5/16” hole into our sugar maple trees at a depth of approximately 1.5”. We insert one tap per tree. A second tap could be added on the larger trees, above 20” in diameter, however doing this will only give you 25% per more sap. We keep it to one tap per tree as we don’t want to jeopardize the health of our trees. 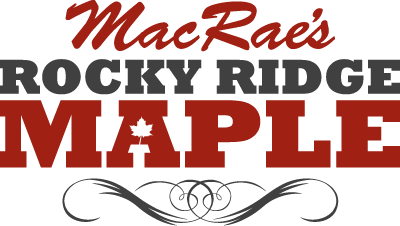 At MacRae’s Rocky Ridge Maple we only tap the sugar maple (rock maple) trees. Once we start getting warm days and cold nights the sap starts to flow. The season can last from late February to mid to late April. The ideal conditions are -6 to -8oC at night and + 6 to +8oC during the day with no wind. One the sap starts to flow and if we see that our vacuum is down, we walk the lines listening and checking for leaks and making repairs as we go. This could mean walking a distance of 5 plus miles checking for leaks in the tubing and piping. Leaks occur when there is damage done by bears, squirrels and/or coyotes chewing the lines. This is mostly due to their curious nature. Line damage can also be caused by wind, weather and falling branches. The sap flows into the sugar camp via the vacuum assisted tubing. A properly running vacuum system can produce three to four times as much sap as a gravity fed system. The objective is to maintain as close to 29 inches of mercury as possible on the vacuum pump. The sap flows into the receiving tank and is then pumped up to the holding tank which is located next to the wood fired evaporator. The sap is boiled within 12 hours of collection. The sap is moved from the evaporator to the wood fired finishing pans at approximately 60o Brix (a measure of sugar content). The sap is then boiled in the finishing pan until it reaches a sugar density of 66.2 to 68o Brix. Then it’s called maple syrup. We measure the sugar content with a hydrotherm and double check the measurement with the refractometer. Now we’re ready to bottle. 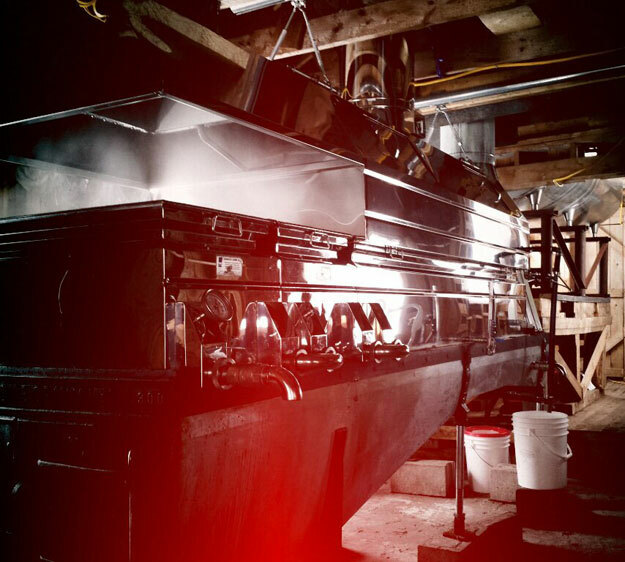 The maple syrup is passed through the filter press; this removes the sugar sand which is a common by product of boiling sap. The syrup is then bottled immediately. The containers are filled at a temperature of no less than 185oF. 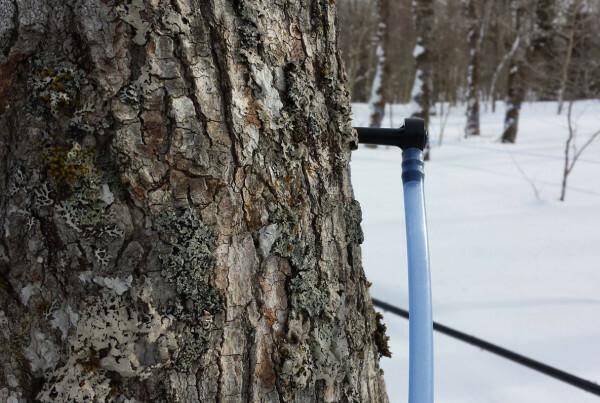 When the maple season ends the next few days are dedicated to cleaning and flushing the lines, removing taps from the trees, cleaning the taps and capping them. Then we start planning for the next year. This usually involves replacing and repairing the lines as well as adding new lines as this is a growing business. We thin the trees in the areas where the new taps will be added. To do this we identify the suitable trees to be tapped and remove the remainder which we then use for firewood to fuel the evaporator. 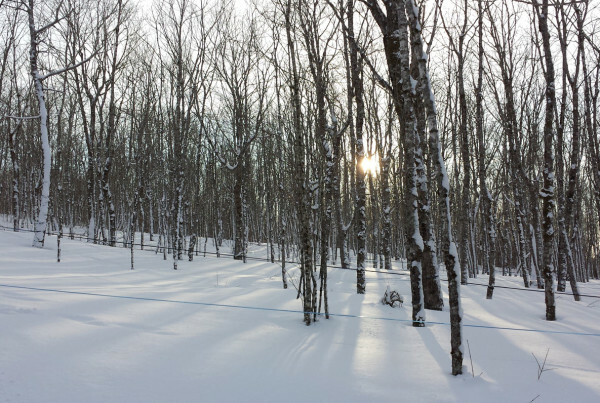 We do responsible woodlot management in our operation.